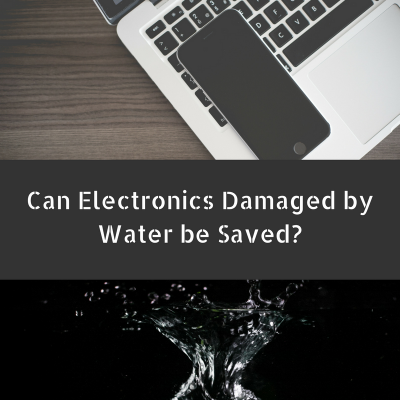 Can I Save Electronics Damaged By Water? First of all, if you come home to or walk into your business which has sustained flooding, the very first thing you should do is turn off the electricity. If you cannot safely reach your breaker box, call experts in immediately. They’ll know how to safely turn off power to your home or office. You already know water and electricity don’t mix and just as you shouldn’t walk in a flooded basement, neither should you attempt to power on any electronics that have been exposed to water. You can’t always see residual moisture in electronics. Under no circumstance should you ever attempt to power on electronics yourself in order to “just test them.” Not only do you run the risk of electric shock, you are likely to further damage the object. Be smart! If you’ve had a leak from an upstairs bathroom and it’s near your TV or other electronics, resist the urge to unplug them. Water could very well have dripped down through the drywall and could be pooling around an electrical outlet. There may be exposed wires you don’t know about hidden in your walls. Call in experienced property restoration specialists who know how to safely contain and mitigate the water damage. They’ll also know what to look for and provide expertise in handling and removing questionable electronics. That prized big screen T.V. may very well find its place back on your living room wall. Your workhorse computer could very well still function. The most important thing to remember is that it is never safe to investigate these things on your own.